Organic Handkerchiefs (taile to choose) are finished with a 5mm narrow rolled hem and embroidered by Philippe Gaber in Paris. The handkerchiefs, are sent in a very nice black box Philippe Gaber. Set of 3 organic handkerchiefs, woven in France, certified Gots then rolled quilted and embroidered with your initials by Philippe Gaber in Paris. 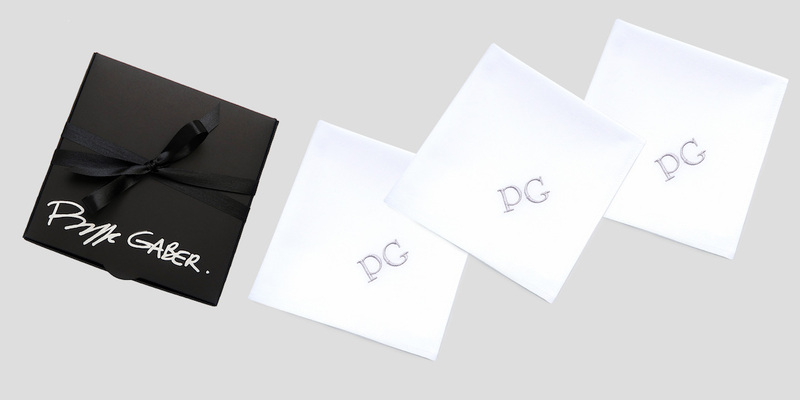 The handkerchiefs are sent in a very nice Philippe Gaber wrapped black box (recycled cardboard). Box containing 3 handkerchiefs carefully wrapped in black tissue paper and accompanied by a card with the mention manufactured for the attention of ... on (date) by philippegaber. There is also the information on the fabric and the handkerchief as well as the care instructions. 40x40cm: this dimension is associated in the Asian Countries, big Fan of handkerchiefs, the version Handkerchiefs for the Woman. More generous in size, it is ideal for a real use of the handkerchief. 45X45cm: Large square, it will be the handkerchief luxury, more ample and will also be suitable as small choker, small Bandana or accessory of the wrist / hair. He is also very appreciated for his greatness as Handkerchief, and this dimension is associated in the Asian Countries, always having the cult of handkerchiefs, as the handkerchief version for the man. The fabric of your handkerchief is exclusive, it is woven in France and is certified Global Organic Textile Standard. The white of the cotton is obtained in an ecological way without agents harmful for the environment and the man. 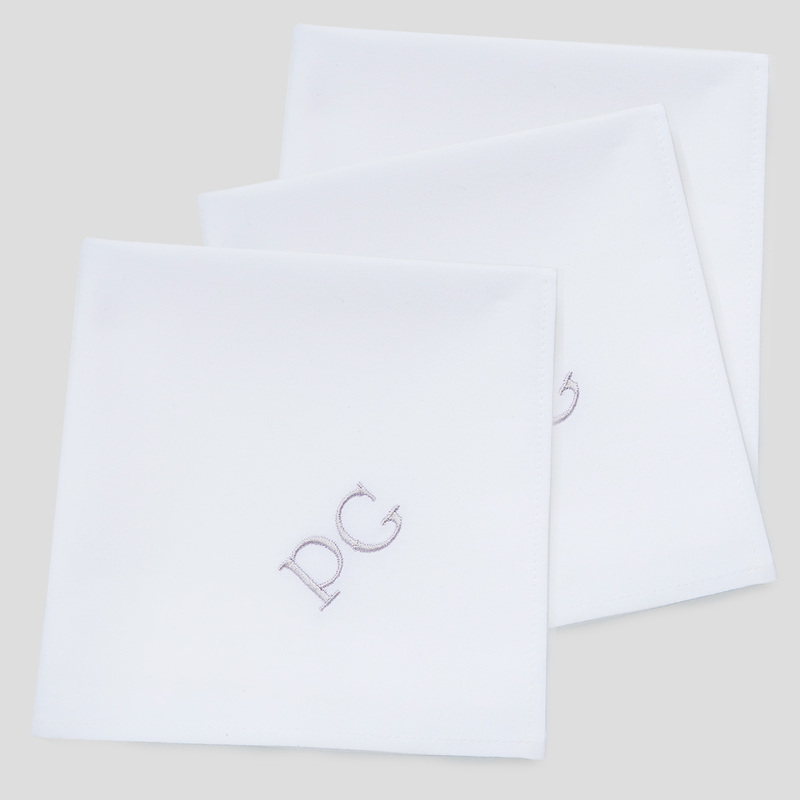 The weight of organic cotton is 120g / m² which is perfect for a handkerchief, not too transparent, neither too heavy nor too fine, it will be perfect for each use. Thanks to this Gots certification, your handkerchief is totally clean, ethical and above all ecological and will not be harmful for anyone. Reusable, washable, elegant it will be perfect for you everyday and will give you a little moment of sweetness. The embroidery thread is made of 100% viscose, a perfect aleternaltive silk, because the viscose Enka is ecological but also vegan. ENKA viscose is a natural product: The basic material, cellulose, is made of sustainably produced wood and processed into high quality viscose yarn at different production levels according to ecological requirements. Biodegradable! It is resistant delicate and very silky. An embroidery made with SULKY® yarn will keep its shine for years. The origin of these benefits comes from the manufacturing process that preserves the environment and retains the natural resources of the yarn. If you want another color do not hesitate to contact philippegaber. The yarn is labeled OEKO-TEX® Textile Confidence Standard 100 N ° BXX20718, OEKO-TEX® is a label aimed at guaranteeing the humano-ecological qualities of textiles and yarn: free from toxic products for the body and the environment. a word longer than 4 characters or initials with a different frieze, a creation or a different style of character, do not hesitate to contact Philippe Gaber at 0156980521 or via the contact form. A supplement may apply depending on your request. If you want a color not present in the colors proposed, you can contact Philippe Gaber, a delay of 2-3 working days is expected to order the color of the chosen wire. 7 - Check the information in the summary of your order: check the letters entered, the color and especially the chosen character style. Embroidered thread of 100% viscose Enka, does not fade and can be washed up to 90 °. The thread will remain silky and luminous over time. Do not use whitening agents for your embroidered handkerchiefs. Dry in the open on a wire or flat. For a more responsible gesture, avoid using the fabric softener. Replace it in the tray provided for this purpose with white vinegar! Indeed, vinegar is used to purify the laundry, eliminates a lot of stains and eliminates odors while preserving the colors and above all, it is a natural softener that softens the water and makes your laundry softer more , and at the same time descaling your machine, 100% natural and organic! To remove all grease stains, use Sommières clay (powdered stone, Montmorillonite) It is a 100% natural and ecological clay, safe for man and the environment. Sprinkle a small pile of Sommières earth on your task and let it work overnight. The grease stain will peel off and come to nestle in the powder. Finally, to remove residues, shake the fabric or brush. This treatment can be renewed as many times as necessary because it will not damage the tissue. The shrinkage rate of cotton is maximum 5%. Ironing: To have easier for ironing, I advise you to iron your handkerchief still slightly wet. If it is already dry, moisten your handkerchief thoroughly with a spray bottle, place it in an airtight plastic bag for half an hour to evenly distribute the moisture, and especially relax the fibers which will allow you to have a much easier ironing. Embroidering your initials on your handkerchief is considered personalization said "custom" by philippe gaber in this case, the right of withdrawal can not apply, in accordance with the provisions of Article L 121-20 of the Consumer Code: the retraction is excluded in particular (Article 121-20.2, third paragraph) for contracts for the supply of goods that are clearly personalized or made to the consumer's specifications, in particular for tailor-made and non-standard measures. Not only is Philippe Gaber committed to the quality and importance of our Made in France, but he is also an eco-responsible brand It manufactures with ethics, for the man and the woman, since its Atelier in Paris every organic sweatshirts, organic t-shirts, handkerchiefs, luxury scarves, handmade ties.